Because of the federal government shutdown, there was no official word from the Bureau of Labor Statistics Friday on September’s unemployment rate or how many payroll jobs businesses added last month (the more significant indicator, according to most economists). But we do have a fairly reliable substitute: the monthly report on private-sector jobs produced by Automatic Data Processing, or ADP. According to ADP, businesses added 166,000 jobs last month. How does ADP, which processes payroll for about 500,000 U.S. businesses, come up with its estimate? ADP began using its dataset in 2001 to try to predict the BLS report; normally, its report comes out one day before the government one. 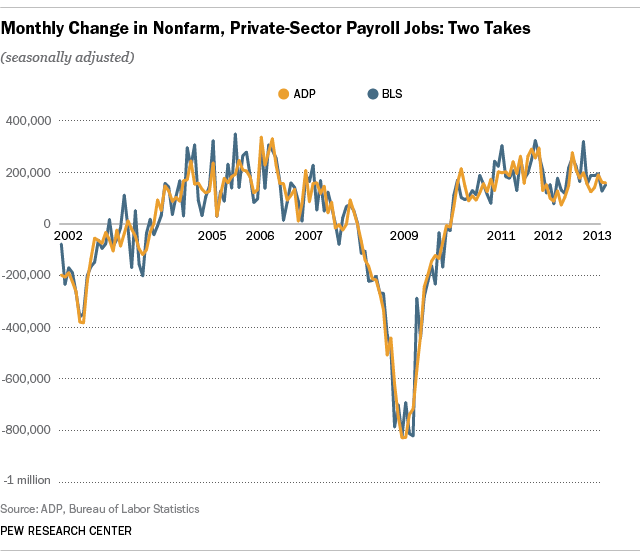 ADP and its partner, Moody’s Analytics, first picks out businesses that reported employment in two consecutive months. In any given month there are more than 400,000 such employers, representing more than 23 million workers. Though large, that dataset isn’t a representative sample of all employers, as the government’s monthly survey of 145,000 establishments and government agencies is. To compensate, Moody’s Analytics weights the ADP data to reflect the overall distribution of private-sector employment, using the (March) Quarterly Census of Employment and Wages as its benchmark. The data are then adjusted to account for seasonal variations in employment. ADP’s data aren’t as detailed as the government’s: For example, it only breaks out employment estimates for five broad industry sectors (construction; manufacturing; trade/transportation/utilities; financial activities; and professional and business services) rather than the detailed industry breakdowns the BLS provides. And government-sector employment is absent entirely. Still, for data-starved analysts seeking a read on the national economy, ADP is (as Deutsche Bank’s chief U.S. economist told MarketWatch) “a close proxy” for the missing government figures.